Education is a vital matter in today’s society. With many students pursuing courses in major universities in India and abroad, banks have come up with attractive student loans to help the not so well off students pursue grander ambitions. When applying for such education loans, an affidavit for the same is essential. Like every other affidavit, an affidavit for education loan too has a declaration part and an affirmation part. When To Use An Affidavit For Education Loan? All students who wish to obtain education loan to pay for their course/tuition fee must prepare an affidavit for education loan. Essentially, this is a document that declares that no other loans from other banks have been taken under the name of the concerned student for the same purpose. The affidavit is then submitted to the bank along with the admission letter from the institution that you plan to attend. How To Use An Affidavit For Education Loan? Our comprehensive predrafted form ensures that you can prepare an education loan affidavit with just a few clicks! Fill in your details and do a thorough review once you are done. The prepared document then has to be printed on stamp paper of required value. 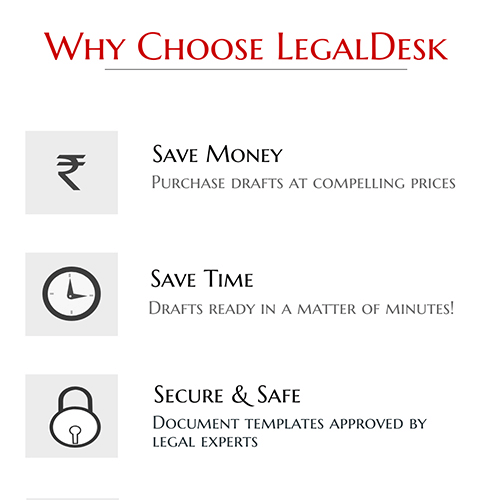 However, if you wish so, LegalDesk.com can print the document on stamp paper and deliver it to you. As long as the affidavit is printed on stamp paper of designated value and attested by a notary, it is held legally valid. To attest it, visit an official who has the power to witness an oath and swear before him to affirm that the facts mentioned in the affidavit are true.